the Barbican Theatre. Courtesy of The Guardian. I’m not hard to please when it comes to going to the theatre. Consequently, I’ll happily rock up when offered tickets to pretty much anything. This normally results in exclamations of ‘What’s this play about?’ as I dawdle to my seat, probably much to the annoyance of my companions. Yet I’m rarely surprised by what unfolds on stage, in fact quite the opposite, I feel I’m pretty good at predicting themes of plays now. 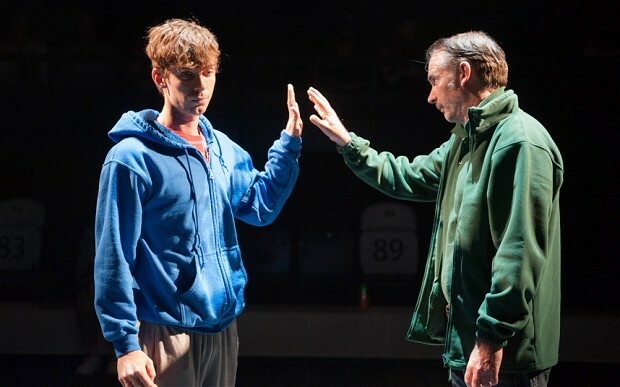 There are the obvious ones – love, hate, money, power – but what really strikes me is the frequency with which I see mental health weaved into plays. It’s not a new theme. 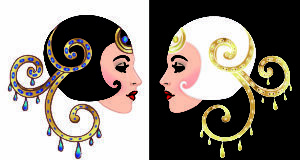 Was Medea unwell when she perpetrated her crimes? 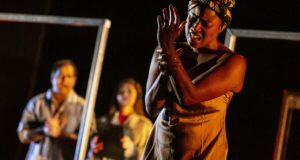 Mike Barlett’s recent adaptation would certainly suggest he thinks so, and a modern reading of Euripides’ original play would be hard pressed to see her as a stable, level-headed person. There is mental illness throughout Shakespeare’s plays, especially his tragedies – what would be the modern day diagnosis of Hamlet, of King Lear, of Othello? Paranoia, depression, morbid jealousy? And how about Wycherley’s The Country Wife? Don’t seem to me to be many stable characters in that either. As someone with a professional interest in health and ill health, perhaps I just notice it more, but it does strike me that within the last year I have been to very few plays where there wasn’t some hint or suggestion, or even down-right discussion, of mental illness on stage. Really it shouldn’t surprise anyone – we all know the statistic banded around about how one in four people will suffer from mental illness (although quite where that figure comes from, and what exactly it means, is up for debate). It’s incredibly common and you can argue its rightful place is to be portrayed as often as it is. But personally I feel that’s not the sole reason we so frequently see mental illness on stage. In fact I think other factors are probably more important, and potentially more worrying. The Effect. Courtesy of Marilyn Kingwell. One aspect that I think is also at play here is that we have an almost macabre fascination with the mentally ill. This stems at least in part from a lack of understanding. When we see someone walking down the street talking to themself, most of us become very uncertain of what to do, and while the vast majority of people with a mental illness are never going to do anyone any harm, anxiety often sets in as a result of portrayals in the media. What the stage therefore provides is a safe space in which to investigate and unfold these ‘other’ people, these mentally ill. What we have is a chance to be voyeurs in situations where common decency would normally force us to turn our heads. Thinking about it like that makes me feel a little uncomfortable. Having said that, you can argue that this is the root of most theatre, and you’d probably be right. We all love the right we gain on walking into a theatre to probe someone else’s life, see their darkest secrets – what you get with mental illness portrayals on stage could be argued to be no different. But this doesn’t feel like the full picture to me. I’d argue that what mental illness also does is to act as an absolutely amazing dramatic tool. It allows people to act in a fashion so strange and fantastical in an otherwise rational and normal drama. Characters will scream and shout, will kill and love, will spend money and throw their life and love away, in a way that no ‘sane’ person ever would. Is this true to the actual experiences of people with mental illness? Probably not, in the vast majority of cases. Apart from anything else, an overwhelming percentage of the questionable statistic I mentioned earlier is likely to be categorised as depressive illness, but someone lying crawled up in a ball for weeks on end without the energy to so much as stir doesn’t make good drama. Consequently it is infrequently or poorly portrayed*. So instead you see the manic parts of mental illness, the dangerous and psychotic patients. And it isn’t just on stage; books and films are just as guilty of cherry picking the fashionable and shocking mental illnesses, although the need for rapid action does potentially skew the stage picture furthest from the truth. of the Dog in the Night-time. Courtesy of Manuel Harlan. Am I criticising the portrayals? How can I – writers, directors and actors have a right to put on stage anything they want. I don’t think murders regularly happen at the same rate as on telly, and there are far more romantic things unfolding on film than anything in my life, but what I would argue is that there is a responsibility for some accuracy in a topic so grossly misunderstood. Mental illness scares us – whether through lack of understanding or fear of it in ourselves. Theatre is a powerful educative tool, and I believe it has a place – and indeed a responsibility – to educate us on this topic. * I’m making a generalisation – there are obvious and important exceptions like Sarah Kane’s 4.48 Psychosis. 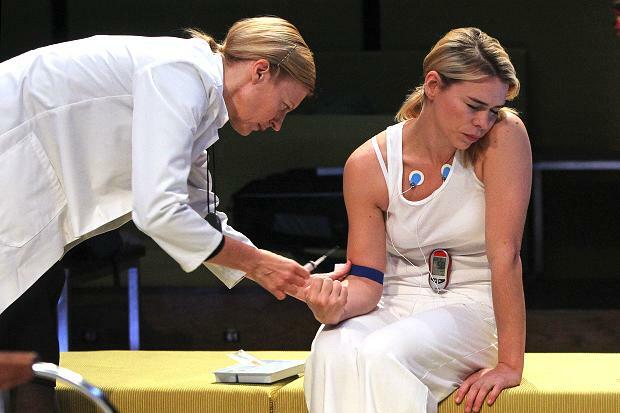 The Effect, a play explicitly about mental health and neuroscience, was a wonderful play and despite its arguable stance on the use of medication in mental illness, the final scene is one of the resounding images I am left with of the last 12 months – Anastasia Hille’s beautiful and heart-rending depiction of depression was exceptional. What do you think? Agree or disagree with Rachel? Have an opinion you’d like to share? Comment below to let us know!